Despite all the negative reviews, Microsoft Security Essentials is still the most popular anti-virus worldwide with the market share of 15.3 percent, according to a report released by Opswat, MSE's market share was increased by 2.3 percent in December 2012. Avast! 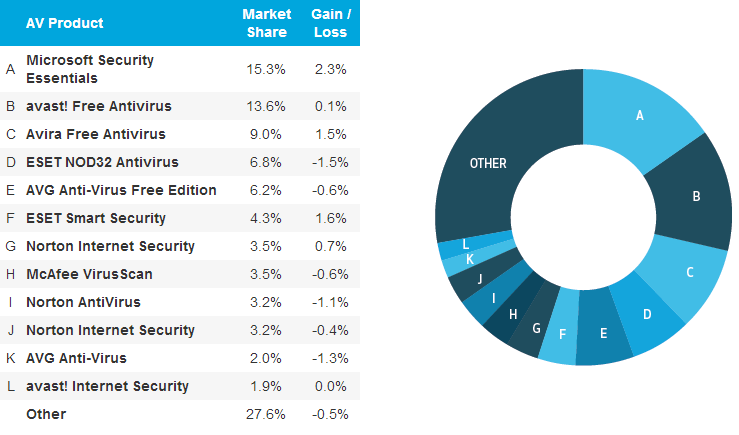 Free Antivirus managed to get the second place with 13.6 percent, followed by Avira Free Antivirus with 9 percent and ESET Nod32 Antivirus with 6.8 percent. 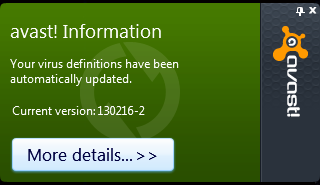 Microsoft offers MSE via Windows Update as an optional update (KB KB2267621) to Windows XP, Windows Vista, and Windows 7 users. This might be the reason why MSE is so much popular in Windows users. How the hell did Avast get so popular? Because Avast is the best! Incoming law suit in EU court. I remember the time when Norton and McAfee used to be the most popular antivirus. AVG was the best free antivirus once. Now it's one of the worsts. also was fond of deleting user32.dll for some reason. A corrupted Windows system can't get infected if the user can't do a thing. That's one of the best protection methods short of exploding a MOSFET or something on the board. AVG is numbah uno!111!1one. MSE, the Internet Explorer of the antivirus world. God help us all. Does avast still have that annoying pop up ad when using it? No, Avast doesn't show any popup. Only twice or thrice a week you will see a small notification which asks you to upgrade. This is a screenshot of a notification. Avast also gives helpfull news and advice within these popups sometimes too. If theres a bad infection or something going around for example. Great idea. Yeah, Avast shows many of your files and web pages have been scanned in last 30 days and how many of them were infected. This is the one of the main reasons I use Avast. You can disable all of these features if you worry about your privacy, but they are useful!